Becoming a Woman of Destiny is a practical and biblically-based guide for women desiring to live an empowered life. Using life lessons from her own and other women's lives, Dr. Sujay reveals ideas and practices that brought her from poverty to power. Key to the book is the practice of creating a circle of women known as the Destiny Circle who mentor and encourage each other. Each of the book's chapters centers on a specific method for realizing and developing the qualities of Deborah, the judge, prophetess, warrior, and wife written about in the Old Testament. The qualities of Intelligence, Spirituality, Action, and Community are illustrated with anecdotes from the author's life. Read this book and discover how to live a powerful, confident life. Hardcover. A book from a celebrated public speaker and spiritual leader—available for the first time in trade paperback format. With timeless biblical principles as a foundation, as well as transformative modern-day examples, Dr. Sujay illustrates that every woman is destined for a remarkable life. In Becoming a Woman of Destiny, she explains how women can release themselves from their prisons of fear, failure, and a painful past, and move forward confidently into their own greatness. Also included in this life-changing book are guidelines for creating Destiny Circles—powerful groups of women who come together for support, inspiration, and encouragement. Becoming a Woman of Destiny is a groundbreaking book that will help any woman wanting to live her fullest present and future. Dr. Suzan Johnson Cook is one of the most distinguished pastors in the nation. She served as the U.S. ambassador-at-large for International Religious Freedom under President Obama. In addition, she was the first black woman to serve as president of the 10,000-member Hampton University Ministers’ Conference, to be elected the senior pastor of the two-hundred-year-old American Baptist Churches of the USA, to be appointed chaplain of the NYPD, and to receive a White House Fellowship. A graduate and faculty member of Harvard University, Cook has worked closely with NBC, ABC, and CBS, and has been featured everywhere from Time Out New York and Ebony magazines to Good Morning America and The Tavis Smiley Show. In this short but spirited volume, Cook, first female president of the Hampton University Ministers' Conference, presents the biblical judge and prophet Deborah as a model for women looking for purpose and fulfillment in a new season of life. As she examines what she calls the four pillars of Deborah's personality--intelligence, spirituality, action, and communityCook creates a bold and meaningful template for self-actualization among women over fifty, replete with personal stories of "women of destiny" of her acquaintance, told skillfully and with respect and admiration. Although the focus of the book is narrow, with too many of her illustrative stories revolving around women in the ministry, its clear central metaphor and logical organization are strengths, as is its practicality: discussion questions and checklists are included at the end of every chapter. Cook herself is a strength; her experience in religious counseling, as well as her clear, optimistic take on Christian values and her obvious enthusiasm for the subject, will leave readers in all phases of life inspired. (Sept.) Copyright 2010 Reed Business Information. "Dr. Suzan Johnson Cook is a brilliant and dynamic woman. Her remarkable life is a testament to the power of her message." "Dr. Sujay has the ability to invoke all audiences, regardless of race, gender, religion, or socioeconomic status. Through her colorful words, Dr. Sujay shares inspiration and encouragement that leaves one feeling revived and recharged." "Becoming a Woman of Destiny brings to mind my mother, Coretta Scott King. The four pillars discussed in Becoming a Woman of Destiny reflect the life [my mother] lived and the lessons she taught as she moved into the second half of her life after my father's assassination. To all mature women, this is a must read to accompany you on your journey to become one of the Wisdom Women." "Cook creates a bold and meaningful template for self-actualization among women over fifty, replete with personal stories of "women of destiny" of her acquaintance, told skillfully and with respect and admiration. Cook herself is a strength; her experience in religious counseling, as well as her clear, optimistic take on Christian values and her obvious enthusiasm for the subject, will leave readers in all phases of life inspired." 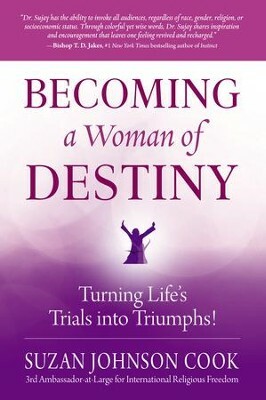 I'm the author/artist and I want to review Becoming a Woman of Destiny: Turning Life's Trials into Triumphs! - eBook.